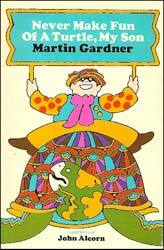 In Martin's memoirs, Undiluted Hocus-Pocus: The Autobiography of Martin Gardner, he not only makes frequent references to his early love of poetry, citing verses remembered for over 80 years, he also included samples of his own efforts in this genre, some of it published in school magazines. He was also very fond of poetic pastiches and parodies. In the 1950s, he'd included items such as "Never Make Fun of a Turtle, My Son" in a collection of "morals for children" poems he wrote for Humpty Dumpty. The slim volume Never Make Fun of a Turtle, My Son (Simon & Shuster, 1969, 45 pages, illustrated by John Alcorn) contains 19 short poems on right-hand pages, matched by appropriate artwork on the facing left-hand pages. Titles include Barbershop, Share Toys, Cry-Baby, Speak Clearly, Medicine, Good Sport, Bedtime and Politeness. Mid-career, several of Martin's annotated books included poems and ballads. In later life, he edited several collection reflecting his tastes. 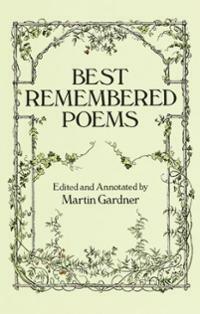 Best Remembered Poems (Dover, 1992, 12 + 210 pages), edited and annotated by Martin Gardner. Works from sixty-five poets are included here, from Black, Browning, and Burns, to Tennyson, Whitman, and the Wordsworths (Samuel and William). Each set of poems has an introductory essay by Martin. 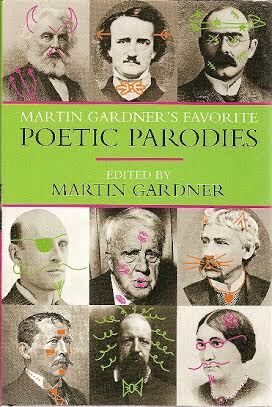 Famous Poems From Bygone Days (Dover, 1995, 14 + 177 pages), edited and annotated by Martin Gardner. 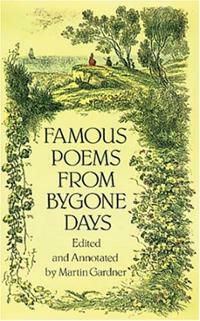 "This book is a companion to my Best Remembered Poems," writes Martin in the Introduction, going on to explain that this time around the focus is on "poems that in the past were well known to American readers, but that today are recalled, if at all, mainly by the elderly." Frost's "Stopping By Woods on a Snowy Evening," Keats' "Ode to a Nightingale," Kipling's "Gunga Din," and Longfellow's "The Village Blacksmith" are just some of the 48 classics given royal treatment here. The originals are followed by parodies from writers as diverse as Ogden Nash, Mad magazine's Frank Jacobs, and Armand T. Ringer. Martin also included poems in his book The No-Sided Professor (Prometheus, 1987, 224 pages).